Nom nom, lunch time. I got more popcorn from the Yahoo booth. Don’t judge me. You don’t know me. Anyway, in the interests of saving my hands, I’ll keep this short. Here’s the line up. Brian Ussery, Director of SEO Technology, Search Discovery Inc.
Vanessa says we’re going to talk about advanced site architecture issues in this session. Hurrays! Maile Ohye is our first speaker. She gives out her credentials which you should know by now. 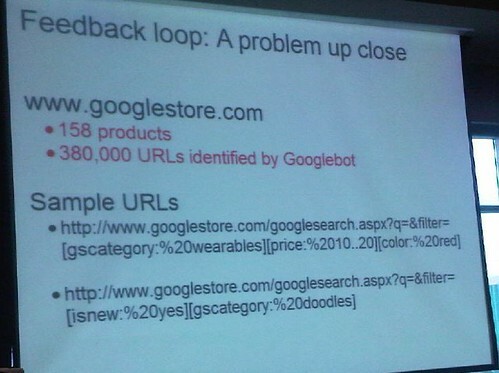 158 products, but 380,000 URLs identified by Googlebot because of category filters, price filters, links, etc. Those are crawled less frequently — also 404 and 410. 400s are also removes from the index. 500s are treated as a transient error. They don’t remove it from the index, and they’ll try again in the future. You can be useful to your users with error code text that explains the problem. Standard vs maverick encoding: Follow standards because Google looks for those and they can’t quite figure out other ways. Using key value pairs, it reduces maintenance for webmasters. You can also tell webmaster tools which parameters to ignore. Adam Audette steps up to the podium. He pimps Vanessa’s book. I really need to pick that up. I’ve heard it’s good. It’s all about user experience. First you have to make the best user experience. Then leverage for maximum SEO. Those things are totally complementary. He highlights Amazon’s user experience, pointing out the lefthand column, the breadcrumbs, etc. You need to evolve your navigations. It’s not just about throwing more links into your nav. Also make use of your link relationships. Know your internal link profile. You need a robust crawler for that. Content is more important than ever. Semantic closeness is important. Use faceted navigation — that’s great for users, however it’s a pain for bots. Make your “view all” page, the canonical version and the default browse. Roll up pages with rel=canonical to that view all page. Brian Ussery follows Adam’s pop culture extravaganza. He’s focusing images. User intent: “How to tie a tye” — first result: text not so good, images very good. The key is to understand the engines. 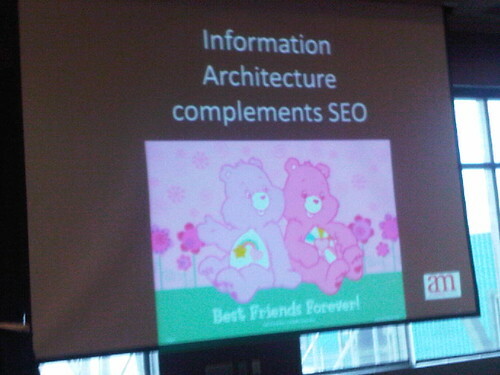 Engines try to align photo SERPs with queries that are going to align with user intent. The size of your monitor will determine how many images will show up in the Universal SERPs. Understand users – they can review a lot of images at once so they take in a lot of images in general. Engines don’t access images directly. Provide Creative Commons license in your RDFa file. There’s Help! You might just not have structural issues, but it might be a lot more (shows funny pictures). Just when you think that Web designers, developers and programmers know SEO, many of them do not. Is site on a CMS, If so, what one? Are there developers/programmers readily available? If you see stuff that doesn’t look fright, write down your findings. 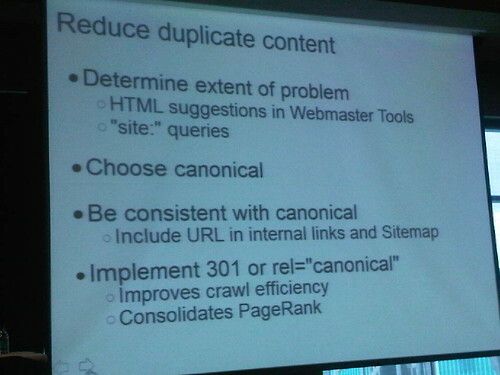 Tells us to sign up for Google Webmaster Tools & methods to correct canonical issues. Shows how to check to see your site link. How to test for an XML sitemap? Put URL (site.com/sitemap.xml) into browser. How to test? Get Firefox addon. Download Firebug and YSlow (Yahoo!) 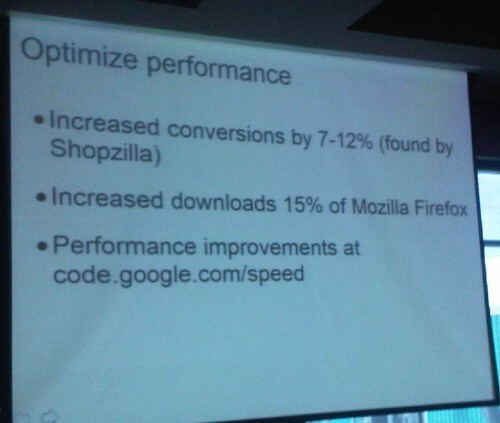 and Page Speed (Google). “Work with your developer to keep you feeling strong?” THAT was not a strong close. Maile: Google still does not want to see search results in search results. She then refers to Adam’s faceted navigation. Google calls it “additive filters.” Nike, example size=5. Creates 380,000 URLs on a Google Store. Team has talked a lot about this. How do you determine what is the best to crawl? Google is brainstorming, discussion about handling URLs after 2 filters. Prevents them from adding more filters. If too many filters, robots.txt it out. 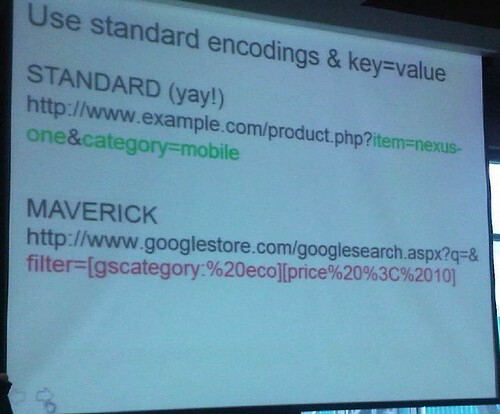 Google’s solutions relies on site using standard encodings and key value pairs. Solution – looking to test it and see how it works. Adam said they see that faceted navigation has strange characters in URLs, not proper encoding. Kinks have not been worked out yet. Q: If you have thousands of pages on your site, is it still okay to use rel=”canoncial” ? A. Yes. If pages have slight variations, should you rel or try to rank. No violation to use rel=canonical. Q. Speed? Are you measuring client side or time server take to bring back page? A. Transfer time is the time looking to calculate. It’s actual user data. Q. Dublin Core – will it be supported? A. Richard Baxter @richardbaxter walked by, got distracted. Q. Something about using text outdent. A. Vanessa talked about header image, putting it off page -9999. Don’t do it! Google is working on some best practices. Maile says text indent is not safe. Q. Does pubsubhubbub get your site ranked faster? A. Right now, it’s not totally incorporated into pipeline. pubsubhubbub has only been around a couple months. Q. Is there a cap on URLs on how many can be put into the index for one site? Q. Is sitemap.xml priority important? A. Don’t spend time on priority numbers. Do put 1.0 for home page. OK… that’s it. Susan walks up, dragging her feet and fingers… We agreed our brains are officially “unoptimized” at this point. Thanks for stopping by. I believe Lori’s presentation was good, useful and informative. I don’t believe it was advanced at the same level that Adam’s was. I don’t think that’s because Lori herself isn’t capable of it — I have full confidence that Lori’s as much of an expert as anyone else sitting on the panel — I just think she made a choice about the level she was speaking to that was different than my expectation of the conference. I’m glad you found it useful and I hope that you told the conference so when you reviewed the session. I know they appreciate the feedback. As do I for that matter. As for “nom, nom, lunch time”, guilty as charged. We like to be a little casual and fun around here. It’s not everyone’s cup of tea. I completely disagree with Susan and Dana about Lori’s presentation. Susan, I’m continuing to wonder why you call yourself an editor. 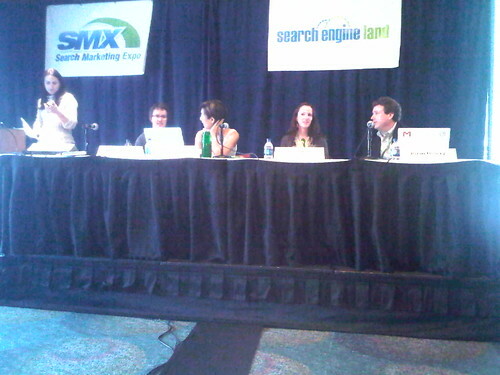 Remember, Susan, SMX Advanced recognized the value in Lori’s presentation which is why they placed her on the panel. I thought her presentation was clear, concise, and useful. Having an “advanced” presentation means nothing if attendees can’t retain or use the information. Also, you shouldn’t knock a presenter’s close with a blog that opens “nom, nom, lunch time.” It’s wonder that anyone takes you seriously. Unfortunately not. I think someone mentioned ALT attributes but there really wasn’t any official solution offered. It’s a bummer, really, because every WP install on the planet uses that method for accessibility. so, when Vanessa and Maile said using text-replacement techniques such as -9000 or indents weren’t safe, did they offer a “safe” alternative to creating an accessible site? Thanks for the recap. I didn’t make it to this session, but there’s a lot of great stuff here (Adam Audette on site structure and audits are always a must at any conference). 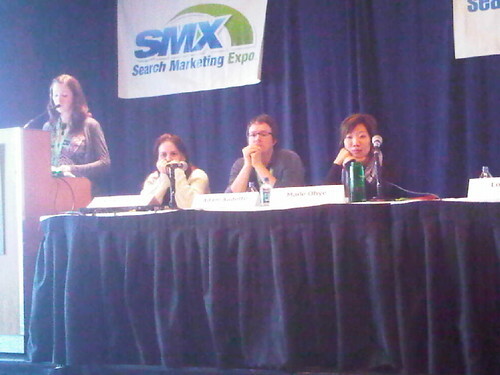 My comment for you – have you seen Maile’s or Brian’s presentations at all on the SMX Advanced site? I noticed they were missing from the list. If you have them let me know, I’d be interested in seeing them. Thanks! Lori, I made the comments about your presentation, and people sitting around me were also commenting. 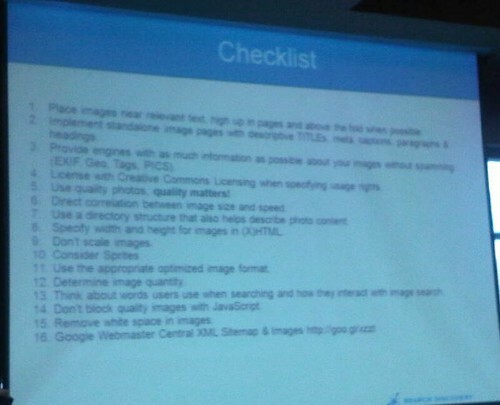 Your presentation and approach was extremely well done but for another audience, not SMX Advanced. Advanced search marketers don’t need to be told to how to look for incoming links or to write new content. We do not spend time breaking down priorities on XML sitemaps. You speak well, and it’s like writing, we need to direct our content for the audience. Susan is correct that anyone can buy a ticket; however, most in the industry are coming here expecting to get something they don’t get at other conferences. Susan, you did an ABSOLUTELY fantastic job capturing this session, which was fast. AND you got pictures? I’m extremely impressed! Nice job! Thanks for stopping by the blog! I agree with you that there were a lot of levels at the conference and for those people, your presentation was valuable. But, and I think you’re agreeing here, your presentation was more basic than the “advanced” level of the conference implies. I actually think this is a larger problem with the conference. There’s no barrier to entry–any level can buy a ticket–so speakers like yourself have to make a choice on whether or not they’re going to address that (and thus end up less advanced) or ignore it and lose part of the audience. I think your presentation was very good and informative for a more basic audience, it was only that the expectation of “Advanced” content made it seem out of place. Just to mention, I spoke with many people there who found the info helpful and did not know it. There are many levels of “advanced.” Some people understand keyword research, titles and descriptions only but consider themselves advanced. Since I know the other panelists would be more advanced, I took a step back. If a marketer (my intended audience) can’t identify these issues, moving forward will be more difficult for them. If you considered it a “duh” moment, I apologize for wasting your time. Others thanked me for taking a step back. Thanks for the notes Susan, got some good takeaways here. Just wanted to drop a comment and say thanks for the hard wrok!